Thank you to each “le artiste” for sharing their inspirational talent at the inaugural gala to benefit the Naples Art Association. Check out the great work they are up to! 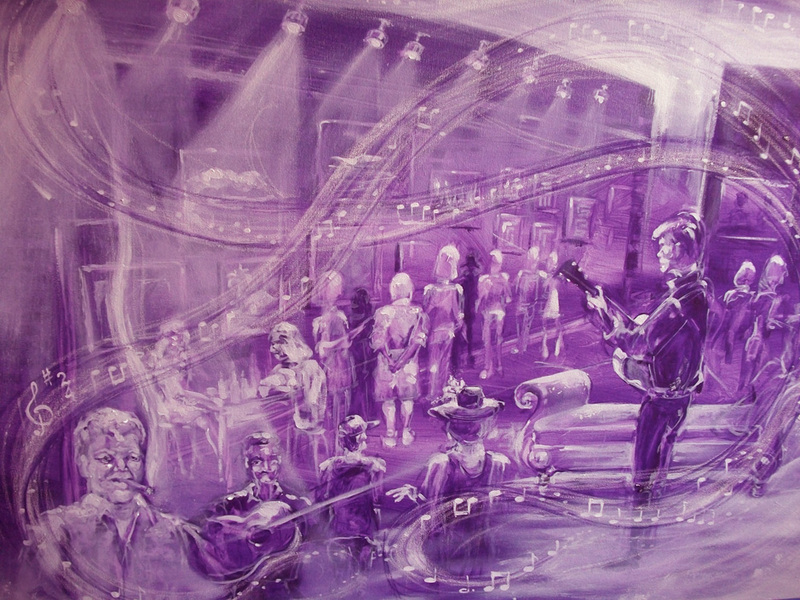 A work that Linda Benson painted live at Music Walk in Fort Myers. Benson is often seen in Fort Myers at events such as Art Walk, Music Walk and the Saturday Art Fair where she demonstrates oil painting in tropical colors at the Arts for ACT Gallery owned by Abuse Council Treatment Inc.
She attended the Art Institute of Chicago and the American Academy of Art prior to 40 years as a commercial artist. Work history: 20 years as a Chicago Tribune Creative Artist, 10 years Furniture Illustrator, 8 years Fort Myers Creative Artist & Supervisor (print advertising), 2 years Key West Composing and Art Dept. Manager (print advertising). Linda will set up her French easel and paint plein-air on site working on canvas, starting on something new for the gala event. She plans to capture the excitement of the evening and extend her participation with the Naples Art Association as a new member. “Smiling Budda” from Susan Daly’s website. Susan W. Daly (susandalyartwork.com), Plein air watercolor, working on something new for this event. Pat DeReamer-Surgener, Fiber art, work­ing on a special gift for a star in the arts! One of Popo Flanigan’s “smileville” renderings! Popo Flanigan (www.popoflanigan.com), Acrylic on canvas, working on a local, soon-to-be-demolished cottage. John Goodlet “Drawn and Quartered” Digital painting. John teaches classes for the Naples Art Association. 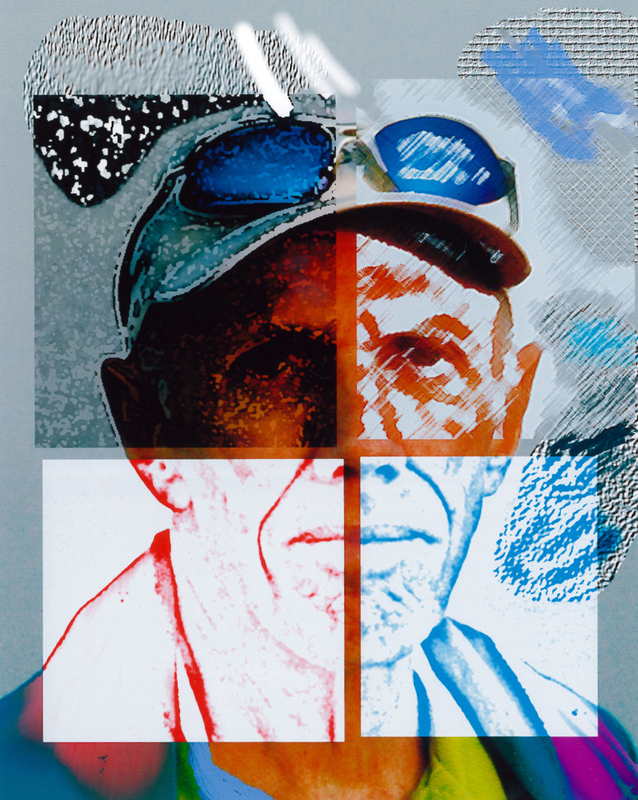 John Goodlet, Digital Painting on Laptop Screen, working on: “Dennis After Tennis” and some new pieces as yet untitled. John was a professor at The City College of New York where he taught engineering and computer aided design (CAD) before retiring to Naples. Since the early 1970’s he was a serious amateur film photographer using both 35 mm SLR and Poloroid color cameras where he specialized in portraiture. In 2000, when he purchased his first digital camera, he switched completely to digital photography and computerized image editing using a variety of software packages such as Adobe Photoshop, Photoshop Elements and Corel Painter to mention a few. Currently, his major interest is in digital painting as a form of artistic expression to enhance, modify, or embellish digital images. Digital painting utilizes scanned images (sketches, old prints, etc.) or digital photographic images as input to digital painting software which can be used to emulate a wide variety of conventional painting techniques and brush styles (oil, acrylic, watercolor etc.) using either a mouse or a magnetic pen and tablet to “paint” the image on-screen. Hardcopy of the digitally painted image can be printed on canvas or watercolor paper from a high resolution inkjet printer (giclee). Digital painting techniques can be used as an original art form – as John uses it – or to supplement conventional painting methods by allowing the artist to rapidly try out new composition, color or stylistic variations on the computer before going to the brush. At The von Liebig Art Center, John teaches a course in Digital Photography and Imaging Editing Using Photoshop Elements. His digital paintings have been displayed in a number of juried shows at The Naples Art Association and The Center for the Arts in Bonita Springs. Just a peek at Leigh Herndon’s work. See more of this one, and a slide show, on her website. Dan Jenson, Oil on panel or oil on linen, work­ing on a representational portrait. An original work by Alisha Koyanis, “Kracken,” painting on vinyl records. Alisha Koyanis (www.koyaniskreations.com), Acrylics, Mixed media. Acrylic on Vinyl records. Mixed Media Paper Doll Shadow Boxes, working on a new, French-themed piece on vinyl records. “The Paper Doll Shadow box series is my latest creation. Inspired by my crazy characters in which I am always painting or doodling. I started creating paper dolls and yet wanted more. Each piece and scene is made entirely of paper in which I carefully paint, cut and joint together. Most all pieces have one or more moveable parts to keep the scene constantly changing for the viewer. All main charachters in my shadow boxes can be moved by the viewer to change the scene. Artwork by Rona Steingart. Learn more about her on her website by clicking the image above. Rona Steingart (artschool-rona-steingart.com), Mixed Media (acrylic, collage), working on something new tonight. “In addition to teaching, presenting workshops, and lecturing for Six Star Entertainment, I’m an active member of the Naples Florida art community. As a member of the Board of Friends of Art of the Naples Museum of Art, I developed, coordinated, and was a presenter in a lecture series consisting of local artists demonstrating and lecturing on their own work. I have taught an adult painting course entitled “Mixing with the Masters” at the Naples Museum of Art, designed to showcase permanent works in the Museum as teaching tools and as inspiration for my students.